Leaf & Foil Size only needs one pass and has an easy release. It will not discolor your treated surface and has been formulated for a smooth and easy application. Size can be rolled or brushed on, will tack up within 45 – 60 minutes (it will take longer on a wall) and will remain tacky until the Clear Topcoat is applied. Leaf & Foil Size by Artisan Enhancements® is a clear, odorless, low VOC water based medium to be used for all foil and leafing projects. Once applied it provides a flawless tacky surface for the application of metallic leafing and foils. 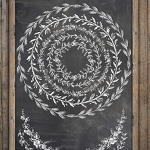 Leaf & Foil Size is a highly versatile product which works well with the entire Artisan Enhancements® line, as well as other decorative paint lines, including Chalk Paint® Decorative Paint. Leaf & Foil Size can be used on previously painted or sealed nonporous surfaces, including furniture and walls. Leaf & Foil Size will not discolor treated surfaces and has been formulated for a smooth and easy application. 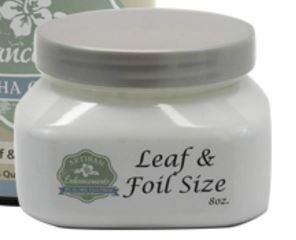 Leaf & Foil Size can be applied to fully dried and cured latex, oil, and water based paints. Leaf & Foil Size can also be applied to natural or stained sealed nonporous wood surfaces. Application: If an undercoat or basecoat is desired, apply paint and allow the paint to completely dry and cure. If working on a nonporous surface that will not be base coated with paint, make sure the surface has been previously sealed. If the surface is unsealed, first seal the nonporous surface with Clear Topcoat Sealer by Artisan Enhancements ®. A helpful tip when trying to decide whether or not to basecoat a piece, metallic gilding foils and leafing will be more vibrant when working on surfaces with a darker basecoat. To assist with easy application of Leaf & Foil Size, lightly mist the surface with water before applying Leaf & Foil Size to the surface. Using an inexpensive chip brush or inexpensive foam roller lightly apply Leaf & Foil Size. Due to the superior adhesive properties of Leaf & Foil Size, only a single pass application of the Size is required. The Size will go on “milky” but dries tacky and clear. Wait 45-60 minutes (for wall applications dry times will be longer) for Leaf & Foil Size to tack up. Do NOT use a heating element to attempt to dry Size quicker. Leaf & Foil Size must air dry naturally. A surface tack test can be achieved with your finger (when you remove your finger you will hear a snapping sound). The surface will remain tacky until sealed. Apply metallic gilding foil (shiny surface up - matte brown side down) or metallic leafing to tacky Leaf & Foil Size layer. If using metallic foils, using a scrub brush or tool, rub foil to ensure adhesion of foil to Size tacky surface. Gently peel back clear plastic from the foil, which has been transferred to the surface. Leaf & Foil Size has an easy release that allows effortless foil applications. When the foiling/leafing stage is completed, allow the foiled/leafed layer to set before sealing. For optimal results, ideally allow the surface to set 24 hours before sealing. Seal the set foiled/leaf surface. For a higher or glossier sheen, apply two thin coats of Clear Finish by Artisan Enhancements ® (allow first coat to dry first before applying second coat. For the best results allow the first coat to dry overnight before applying the second coat). If a matte finish is desired, apply a thin coat of Clear Topcoat Sealer by Artisan Enhancements ®. If you do not seal your surface it will remain tacky indefinitely. Follow the recommended instructions for Clear Topcoat Sealer and Clear Finish cure times before using the surface. Clean up & Product Storage: Use hand sanitizer to remove “tackiness” from hands and fingers. Use rubbing alcohol to remove Size from tools. After cleaning with rubbing alcohol rinse with warm water to remove any remaining alcohol residue. Do not let freeze or expose to direct sunlight/extreme heat. Do not apply product when air and surface temperatures are below 50°F (10°C). Seal the container tightly. When resealing product use alcohol around rim before resealing or apply foil under rim so it won’t stick.